From $1 microscopes to shape-shifting robots, we covered some pretty awesome engineering stories in 2015. Here’s a look back at them. We began the year diving deep into the ocean and showing how scientists at the California Academy of Sciences engineered a device that safely brings fish up from the twilight zone, a region of the ocean so deep that light barely reaches it. Fish living at these depths are accustomed to life at a higher pressure, and because many fish have a gas-filled organ called a swim bladder, they are super sensitive to fast changes in pressure. If scientists want to bring the fish up to study them at sea level, their swim bladders can expand and crush other vital organs– killing the fish. So scientists at the California Academy of Sciences engineered a portable device that maintains high ocean pressures, so they can collect the fish and bring them safely to the surface. For an even deeper learning experience, check out our collection of associated resources about this project, including science and career spotlight videos, a hands-on activity, a Do Now activity and an e-book. 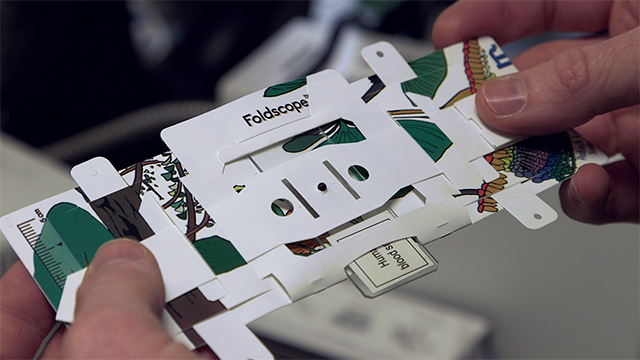 Next, we got an up-close look at how Manu Prakash, a bioengineer at Stanford University created the Foldscope, a $1 paper microscope. This nifty invention could one day help diagnose diseases in remote or resource-poor areas throughout the world. In fact, these microscopes are currently in validation studies and clinical trials to be used as diagnostic tools for malaria, African sleeping sickness and schistosomiasis. In addition to diagnosing diseases, he hopes these microscopes will be used by students, teachers and life-long learners to explore their own world. Through the Ten Thousand Microscope Project, Prakash has shipped approximately 50,000 Foldscopes to students and lifelong learners in more than 130 countries who submitted ideas for experiments or questions that they would like to answer using the Foldscopes. To get a closer look at this project, check out our collection of associated resources including a science and career spotlight video, a Do Now activity and an e-book. In this story, we focused on Dhaka, Bangladesh, the tenth largest city in the world, where travel by boat and Rickshaw is a common way to get around town. While the waterways are an inviting lure to this populated city, water is also the source of many diseases, particularly in Dhaka’s crowded slums. Here, sewage can seep into low-pressure, old, leaky pipes that transport the town’s drinking water, exposing residents to harmful bacteria and viruses. But, researchers at Stanford University have engineered a cheap device that can clean drinking water where it is collected, at communal hand-pumps. For more resources about this project, check out our collection, which includes a science and career spotlight video and an e-book. A fan favorite of 2015, this engineering story is out of this world, (or, it might be one day). Researchers at NASA Ames Research Center in Mountain View, CA have teamed up with researchers at University of California, Berkeley to design and engineer what might be the next generation of space-exploring robots. These robots are wildly different than traditional rovers, which are super expensive, really heavy and hard to land. The new robots are based on a type of structure known as a “tensegrity” structure. For more resources about this project, check out our collection, which includes a science and career spotlight video, classroom activities and an e-book. For this story, we got the inside scoop about a 3-D mapping backpack from Avideh Zakhor, a UC Berkeley professor of electrical engineering, who created the device. This technology, which can map the interior of buildings, has a lot of potential applications including aiding with search and rescue, commercial real estate, building construction and energy audits. Some companies are even putting consumer grade versions of this technology in smartphones, so users can create their own 3-D maps of interior buildings. Check out our collection of resources for this engineering story, which includes science and career spotlight videos and classroom activities. Our last engineering story for 2015 took us through the streets of San Francisco where we discovered how Lava Mae, a non-profit organization recycles retired public transportation buses and converts them into mobile showers for San Francisco’s homeless population. Check out how these shower buses work, and the thoughtful design that went into them. More resources about this project coming soon.